xiii, 162 pages ; 23 cm. 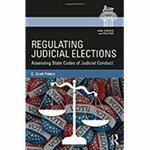 Peters, Scott C., "Regulating Judicial Elections: Assessing State Codes of Judicial Conduct" (2018). Faculty Book Gallery. 423.